Seven years ago, when I re-habilitated my grandparents' house on Lawton Lane, I discovered layers of linoleum (older Ocracokers called it "carpet"), one on top of the other, that had been laid down on the floors. As I pulled the linoleum off I began to realize that I had come across something akin to an archeological discovery. Over several days I collected one 8 X 10 sample of every design. All told I found 16 different patterns. The photo shows three of them. I thought I might frame and mount them, but I never have. But I have stored them in protective plastic sleeves...and I bring them out every now and then to show visitors. This is the time of year for head colds, allergies, and the flu. I should know. Even though I have been feeling much better for several days, I still have a residual cough and the sniffles. As O'cockers say, I've been doasted right. Earlier this month a reader asked about the impact the Influenza Epidemic of 1918-1919 had on Ocracoke. There is no one alive on the island who remembers when the pandemic swept across the world. However, some older folks remember a few stories. It seems that Ocracoke fared better than many places. Nevertheless, several people living on the island contracted the flu, but we don't know how many, if any, died from it. For example, my grandparents' thirteenth child, Aliph Dean, died in October of 1918. She was not even one month old. We do not know the cause of death. Also, a few islanders who had moved to Philadelphia and other northern port cities came down with this particularly virulent flu that killed between 50 and 100 million people worldwide. This 2012 season of colds and allergies on Ocracoke has been annoying, but mild compared to 1918-1919. Let's hope it doesn't get any worse! Blanche has told me several times that Wesley Austin, Ocracoke Lighthouse keeper from 1912-1929, enjoyed giving people tours of the lighthouse. 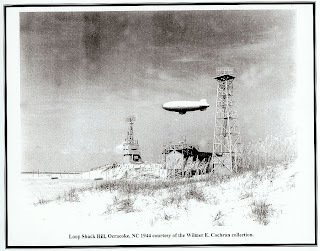 That, of course, was in the days before Ocracoke became a popular tourist destination. He especially liked showing the tower to island children. Lela Howard (Blanche's sister) and Lela's playmate, Virginia Howard (both were born in 1911), would visit the lighthouse every Fourth of July after they were about eight years old. Wesley greeted them and invited them to climb to the top. From the lantern room the children would crawl through the access door onto the balcony, then sit on the ledge with their legs hanging over the side. What a spectacular view they had! If the above story makes parents cringe with fear, consider the following account by Dorothy Gaskill from the book, "Lighthouse Families." Dorothy Gaskill is the daughter of Vernon Gaskill, Sr. who was Principal Keeper of the Bodie Island Lighthouse from 1919-1939. "We used to climb over the railing [of the catwalk] and walk on the ledge -- six or seven inches wide at the most -- and lean out hanging onto the railing. Of course this was without our parents' knowledge!" On Saturday morning I gathered together the registration certificate for my 1994 Ford pickup truck, my driver's license, and my checkbook, and headed to the National Park Service building to get my beach driving permit. All of the rangers there were pleasant and cordial. I asked about responses to the new regulations. I was told that the Park Service has issued about 100 permits so far, almost all of them annual permits. Of course, some people complained about the fees, but apparently everyone has been civil. With my permit affixed to the windshield, I got David and Lachlan, and we went for a scud down to South Point. It was a perfectly beautiful winter day with colors that seem to appear only on chilly, windy days. We saw only two other vehicles -- one neighbor, and a couple from Virginia, bundled up for protection from the wind, doing some surf fishing. Back in the village we stopped at the Post Office to check our mail. That's where we met Tom Wright who has restored a 1929 Model A Ford, and who drives it around the village. He offered to take us for a ride. What a fun time we had. 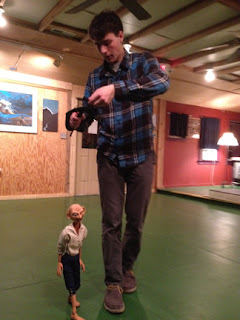 Tom showed us how to advance the spark, choke the carburetor, turn the key, then press the starter button. The engine jumped to life and we toured the village. Tom blew the horn for us, showed us the gauges, and propped open the windshield (1929 air conditioning, he called it). On the way to the air strip we managed to accelerate to 45 mph, but we could hardly hear each other talk because the engine was so loud. Back at the Post Office Lachlan thanked Tom and pronounced the adventure "awesome." I am not a birder, but many folks who live on Ocracoke, or visit here, know a lot about birds. Peter Vankovitch, who just moved back to the island, recently started a bird watching group. Not many days ago Bill and I saw fairly large white birds with black wingtips diving for fish off shore. We weren't sure what they were, but Peter identified them as gannets. Apparently, they migrate through here this time of the year. I learned a number of fascinating facts about gannets. They dive from great distances (as much as 100 feet), and travel as fast as 60 mph when they hit the water. As a result, they can pursue fish much deeper than many other birds. Gannets have several adaptations that facilitate their behavior, including air sacs in their faces to help protect them from the impact, and no external nostrils. Two days ago we noticed a bittern feeding in the ditch alongside NC Hwy 12, between the airstrip and the campground. The bittern is a fairly large bird in the heron family. Though not an everyday occurrence, it is not unusual to see bitterns wading in the marsh looking for insects, fish, and small reptiles. I doubt I will ever be an expert on birds, but I do enjoy learning about them as I wander about the island. On Wednesday afternoon Amy & I were standing in front of Eduardo's Taco Stand near the Variety Store when I noticed one of Ocracoke's newest teachers riding by on his bicycle. "Amy," I said, "I should invite him over for dinner sometime. I have never had a chance to spend any time with him." Moments later he rode by again. "Shay," I called out. He rode over and we asked him if he wanted to join us for dinner. He agreed without any hesitation. He ordered a burrito, and we went back to my house to join David and Lachlan for an enjoyable evening of great Mexican food and lively conversation. Shay Youell is our new middle school language arts teacher. He is in his mid-20s, with connections to Virginia and North Carolina. It was clear from our first conversation that he is full of energy and enthusiastic about language, literature and teaching. One of his classes has 19 students, one of the largest classes ever at Ocracoke School. One of the many things I like about Ocracoke is the spontaneity. Sometimes a notion just pops into our heads and we go for it. There was no planning, no stress or worry. Just on the spur of the moment we created an evening of fun, and strengthened our sense of community at the same time. Ocracoke Alive, a cultural, artistic, educational, and environmental non-profit group will be sponsoring the Celitc musical band Craicdown in concert on Sunday, February 26, 7 PM at Deepwater Theater. 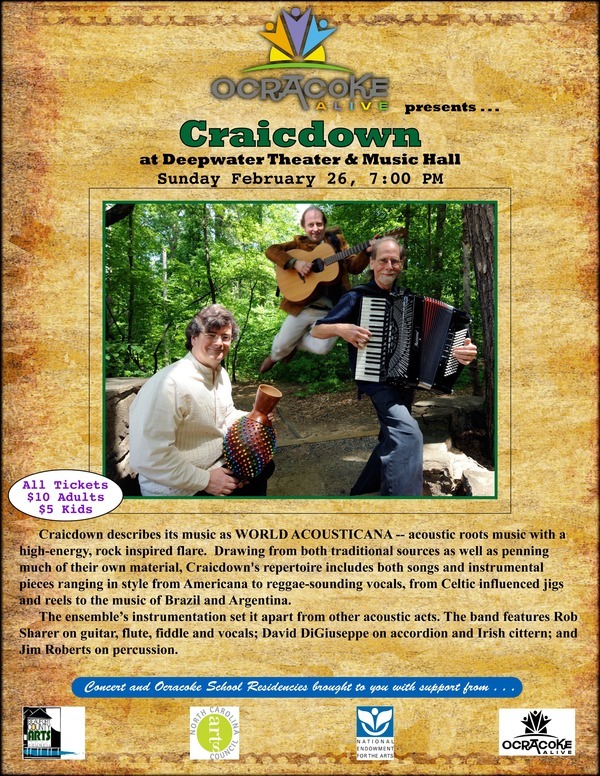 Craicdown describes its music as WORLD ACOUSTICANA -- acoustic roots music with a high-energy, rock inspired flare. 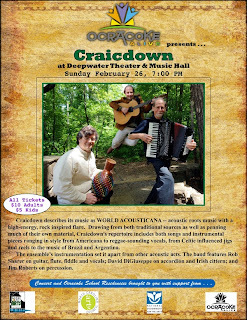 Drawing from both traditional sources as well as penning much of their own material, Craicdown's repertoire includes both songs and instrumental pieces ranging in style from Americana to reggae-sounding vocals, from Celtic influenced jigs and reels to the music of Brazil and Argentina. The ensemble’s instrumentation sets it apart from other acoustic acts. The band features Rob Sharer on guitar, flute, fiddle and vocals; David DiGiuseppe on accordion and Irish cittern; and Jim Roberts on percussion. 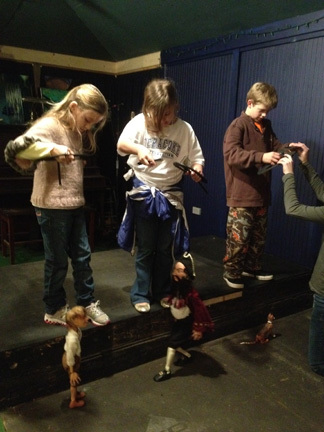 During the following week Craicdown will be giving performances for Ocracoke School students. Come on out and get inspired by some high quality, energizing music! On January 28 I mentioned Josephus Daniels, Jr., Secretary of the Navy during WWI, and his connection to Ocracoke. This month's Ocracoke Newsletter is a brief account of the Civil War on the Outer Banks, the Josephus Daniels, Sr. family connection to Ocracoke during that period, and Josephus Jr.'s subsequent life and career as a newspaper publisher, Secretary of the Navy, and Ambassador to Mexico. You can read this latest Ocracoke Newsletter here: http://www.villagecraftsmen.com/news022112.htm. On this date in 1854 the sailing vessel Orline St. John encountered a severe gale and heavy seas in the Atlantic Ocean. The ship was dismasted and sank off the coast of Hatteras Island. The captain's wife and several crew members drowned or died of exposure as the derelict vessel wallowed in the surf for a week and a half. According to David Stick in The Graveyard of the Atlantic (1952), the remaining crew members who "suffered constantly from cold and exposure" survived only by eating the body of a sailor named Douglass who had died in the rigging, and whose body was left hanging there. Stick says this is the only case of cannibalism on the North Carolina coast that had come to his attention. The shifting winds have brought many islanders down with cold symptoms. Allergy symptoms are on the rise too as the cedars are full of pollen. I won't be posting anything else today or possibly the next couple of days depending on how my cold symptoms progress. Right now, I'm happy to stay in bed to rest and recover. "What's happened has happened, and what's going to happen is going to happen, so enjoy the sun on your face right now." That quotation from an Ocracoke islander is recorded on page 31 of Ann Ehringhaus' book Ocracoke Portrait. It is under a photo of Henry (or Hank...I can't remember his last name) who found his way to Ocracoke about 25 years ago. Henry was elderly, spoke in a gravelly voice, almost always wore a jacket and necktie, and walked around the village pushing his bicycle as if it were a walker. His black dog was a constant companion. 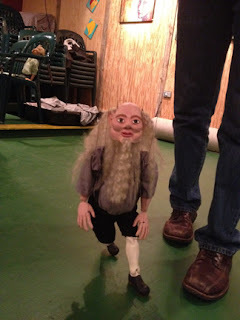 Henry was quite a character. He lived in a modest little cabin on the south side of Cockle Creek. In the winter he once rolled a smoldering log under his house to help keep it warm! He was gregarious, and made many friends, but I never learned where he came from or what he had done for a living. He was arrested once for a minor infraction of societal norms, but no one thought the worse of him for it. He eventually moved away because of health issues, and I don't know what finally became of him. It is fitting that Ann paired the above quotation with Henry's photo. He was pretty much the embodiment of that sentiment. Henry was just one of many colorful people who have called Ocracoke "home." But now she's gone across Jordan." I understand that some years later the figurehead was sold by a family member to a summer resident of Nags Head. I wonder if any of our readers might know where that figurehead is today. Please leave a comment if you do. "Everybody is Equal," that is the title of a chapter in Carl Goerch's 1956 book, Ocracoke. Goerch notes that North Carolina congressmen and senators frequently visited Ocracoke because they fell in love with this place. When they came to the island, he tells us, Ocracokers routinely addressed them by their first names: Lindsay, Herbert, and Joe. Goerch adds this advice for newcomers to the island: "And for heaven's sake, if you've never been to Ocracoke, don't make the mistake of patronizing the people down there just because they live in a location which might be described as being isolated. If you do, you're sunk, so far as the natives are concerned. "You may have all the money in the world, be known all over this country, wield all kinds of influence but it won't get you anywhere. If the people on the island like you it's because of you, yourself. If they don't like you, it's for the same reason." Not much has changed in 55 years! "...being in attendance during that day [February 15, 1848] a few hours previous to the death of said Garrish, he appeared to manifest much anxiety relating to some worldly matters which seemed to bear heavily on his mind, which his extreme weakness prevailed his expressing, although he undoubtedly retained his perfect since [sense] to the last. Yet, he was sufficiently understood as wanting paper and pen and ink, which induced a belief that he wished to make a will. Consequently, as he was unable to write, we concluded to question him in the following manner, and having reason to believe that his wish was in regards to his property, JOHN PIKE, Esq. (who was present) asked him to signify to the same by raising his hand if it is his wish that his daughter EUPHEMIA CURTIS should possess the whole of his estate at his death. He did raise his hand in reply and we distinctly heard him say, yes. After which, he became quite reconciled and resigned up to the time of his death." Euphemia Garrish Curtis (1819-1882) inherited the property where Village Craftsmen is now located. Her father, Simon Henry Garrish, appears to never have married Euphemia's mother, Jane Simpson Harvey, although they lived together as man and wife for many years. Simon was the son of Henry Garrish and Elizabeth Howard. Elizabeth was the granddaughter of William Howard, Sr., one-time owner of Ocracoke Island. Euphemia is my 2nd cousin, 3 times removed. She lives with Christ our head." I think of Euphemia every time I pass her grave. May she rest in peace. Over the years I have periodically mentioned the distinctive Ocracoke brogue, and have even pointed out unique and unusual Ocracoke words and phrases. Pizer, mommuck, buck, and givvy come to mind. Recently I was perusing a yet-to-be-published chapter of a book about the Outer Banks brogue. I was reminded that a dialect's features may include much more than accent and a distinctive vocabulary. One aspect of Ocracoke speech is a "ritualized language routine" sometimes referred to as "talking backwards." If you hang around Ocracoke long enough you will eventually hear someone say something like this: "De Blessed Father, that's one fancy outfit you've got on." What they mean is just the opposite, that you're out and about in your dirty old work clothes. Or you might hear someone exclaim, "That's one ugly young-un you've got!" when they are paying the parents a heartfelt compliment about their beautiful child. Of course, the context, inflection, and body language are all important. If you are not used to this method of speech you might be a tad confused. But it does help make the local dialect even more interesting. By yesterday afternoon the mercury had climbed into the low 40s, quite a different scenario from the day before. The sky was clear, and a winter crispness lingered in the air. Only a few wispy clouds hung above the beach as medium-sized waves broke cleanly on the bar, and smaller, languid waves lapped against the shore. Dozens of dolphins were making their way south, an occasional one slowing down to surf just under the surface or leap above the breakers with a flourish. Farther offshore there was an unbroken line of cormorants heading out to an afternoon rendezvous. The horizon seemed to be undulating as thousands of the diving fish-eaters flew by. It was impossible to estimate their numbers accurately. Amy thought there were at least 50,000. I guessed closer to 100,000. Every day at the beach is a different experience. And every day out there is a delight. Two gentlemen with strong ties to Ocracoke died recently. On Monday, February 6 Elmo Murray Fulcher, Jr. died at Sentara Norfolk General Hospital. Although Murray had not lived on Ocracoke recently, he will be remembered by many family and friends. His mother, Lillian Jackson Fulcher, was a native islander, and his father, Elmo Fulcher, Sr., was captain of the Mailboat Aleta in the 1940s and 1950s, as well as a local commercial fisherman. Islanders and visitors from several decades ago will remember when Murray ran the fish house and captained the steel trawler, the She-Don-Di. He was a tireless advocate for commercial fishermen in eastern North Carolina. 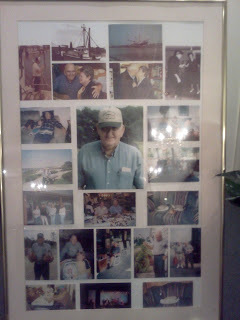 Collage: Elmo Murray Fulcher, Jr.
Charlie Jones died Thursday, February 9, at his home in Michigan. 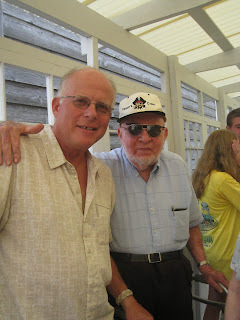 Charlie was one of five children of Sam Jones and Mary Ruth Kelly (see our Ocracoke Newsletter for January, 2011: http://www.villagecraftsmen.com/news012111.htm). Paul Dickson had this to say about his father-in-law's connection with Ocracoke: "Having spent many summers there growing up, he has fond memories of the island and remembers many of the stories you have been relating via the blog. One of his favorites was the story about the mail boat Aleta which he spent many hours on throughout his visits there....I spent my last visit with him last Sunday reading the Ocracoke Journal to him as I had done many times over the last year or so. It was our special connection "
I had almost forgotten what February is like! Then, after dark last night Old Man Winter roared across the island, huffing and puffing. In short order, trees were dancing and my porch swing was swaying as 35-45 mph frigid winds forced temperatures down to near freezing. 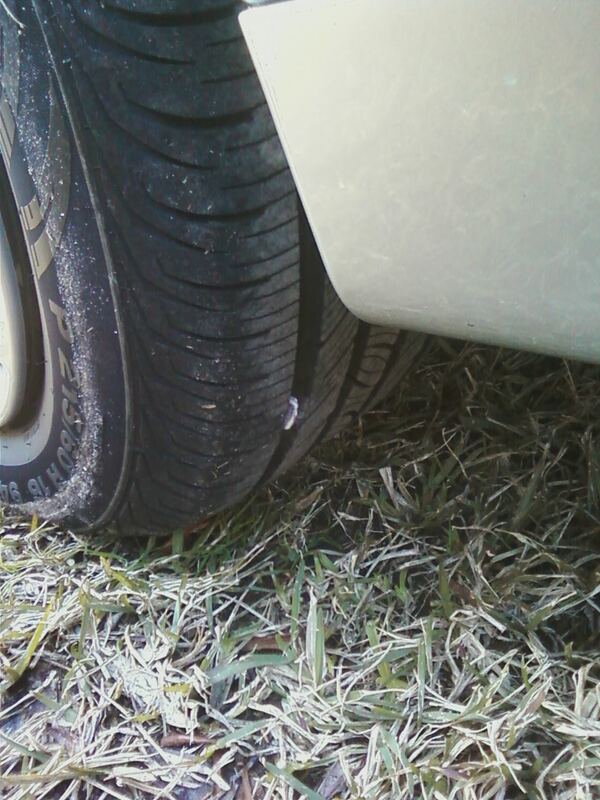 By early morning the temperature was in the upper 20s, and now it feels like it is in the teens. 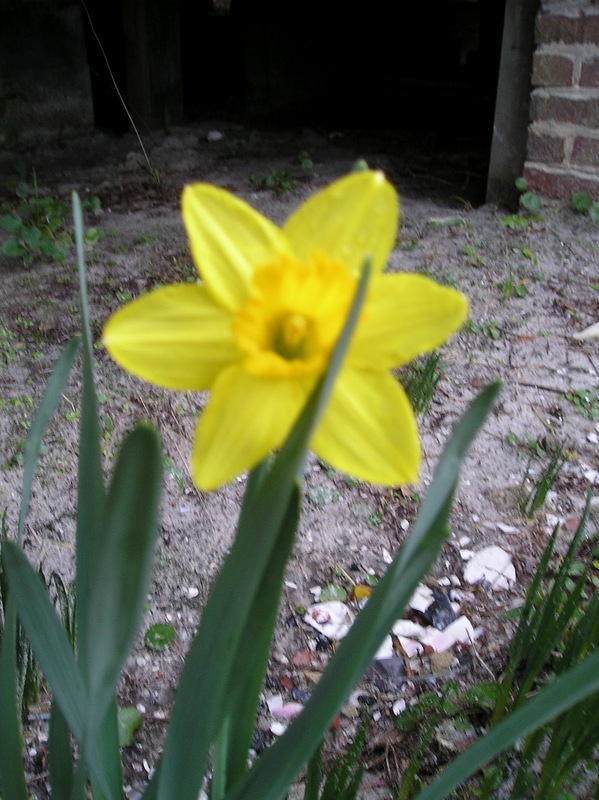 Until now it had been exceptionally mild (take a look at Thursday's blog). Flowers were blooming, neighbors were working outside in shirtsleeves, and thoughts were turning to spring. Today, folks will be huddling around their fireplaces trying to stay warm. I think I'll work outside another day. Several days ago I relayed one of the "101 Things I Think I Learned While Sailing With Marlene on Different Drummer." If you will remember, the list was compiled by the skipper of the Different Drummer, a 39' catamaran he and his wife were cruising on last summer. His #5 item concerns Blackbeard. 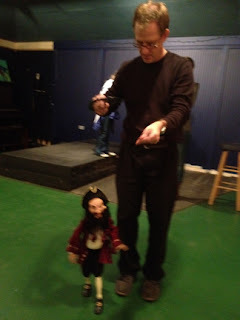 I recently had an opportunity to visit the Blackbeard exhibit at the Maritime Museum in Beaufort, NC. By the way, the exhibits there are just wonderful. Consider stopping there on your next trip through eastern North Carolina. You won't be disappointed! "DO NOT, REPEAT, DO NOT, sail over the wreck of Capt. Edward Teach's flagship Queen Anne's Revenge, sunken in Beaufort, North Carolina, inlet. A.K.A. "Blackbeard the Pirate," sailing over Capt. Teach's sunken ship is said to be bad juju and results in bad karma. We did it early on, shortly before our first engine blew up. 'You're done for!' said 86 year-old sailor Richard, drinking straight, very expensive rum at Bob Laverty's pool party in Oriental. 'But I didn't know!' I cried. 'You're still done for,' he said." Last Friday the North Carolina Marionette Theater (http://northcarolinamarionettes.com/), based on the Outer Banks, held workshops on Ocracoke. Deb and Mark and their crew performed on the island last summer, bringing delight to young and old with their story of Tom Benn and Blackbeard the Pirate. On June 28, 1914, a Bosnian-Serb assassinated Archduke Franz Ferdinand of Austria, heir to the Austro-Hungarian throne. Exactly one month later, after a period of diplomatic maneuvering among major European powers, Austria-Hungary declared war on Serbia. Initially, the United States followed a policy of non-intervention. In 1915 a German U-boat sank the British liner, Lusistania, killing 128 Americans. Under pressure from president Wilson, Germany suspended attacks on passenger vessels. That lasted until June of 1917. Only after the sinking of seven U.S. merchant ships did the U.S. Congress finally declare war on Germany, on April 6, 1917. United States warships were immediately pressed into service to transport and protect troops sent to France. The east coast of the US was left virtually unprotected. By June 5 the U-151, the first enemy warship to invade US waters in more than 100 years, arrived off the Carolina coast. She had already laid mines in the Chesapeake Bay, Delaware Bay, and New York harbor. From that time until the end of the war, in November of 1918, seven German submarines attacked and sank eleven vessels off the coast of North Carolina (the Harpathian, the Vinland, the Pinar Del Rio, the Vindeggen, the Heinrich Lund, the Jennings, the Stanley M. Seaman, Lightship #71, the Merak, the Mirlo, and the Nordhav). The sinking of the lightship, a 124 foot vessel anchored by heavy chains and a 5,000 pound anchor in 185 fathoms of water 12 miles off shore of Cape Hatteras, came as a total surprise. Everyone believed that German submarines would consider her light as important for their navigation as for US shipping. When the Mirlo struck a mine laid down by German U-boats in August of 1918 the 6,679 ton tanker, with a full cargo of gasoline, exploded, quickly turning the ocean into a raging inferno. The rescue of 42 of the 52 crew members by Coast Guard Captain John Allen Midgett and his crew from the Chicamacomico Station was one of the most dramatic rescues in the annals of the United States Coast Guard. Captain Midgett and his crew all received Gold Lifesaving Medals for their bravery and heroism. For a more complete account of World War I and the Outer Banks please see Chapter 14, "Unguarded Shores," in the book, Graveyard of the Atlantic, by David Stick. Captain Rob recently contributed an excellent article about Boating Safety Courses to Ocracoke's new on-line web site, the Ocracoke Current. You can read his article here: http://www.ocracokecurrent.com/20845. Of course, Rob is an experienced captain (and at least 26 years old, I am sure), but he found the certification "a good thing to have...whether you need it or not." I decided to take Rob's advice, and enroll in the course. On Friday I posted a photo of a rusted and twisted piece of metal. 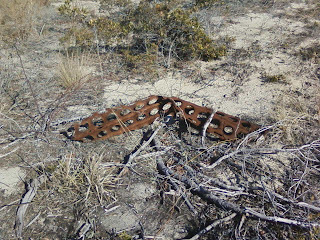 As several of our readers knew, it is a section of WWII-era steel landing mat. Our military used them for amphibious landings in Europe. In 1957 North Carolina built the first hardened road from the village to Hatteras Inlet. However, the last three miles was not paved. Instead, one lane of WWII landing mats was laid down. Every half mile a short section was added to allow one car to pull over so an approaching vehicle could pass. There were never any head-on collisions, but, as you might imagine, cars regularly had to back up when two vehicles met between the pull-overs. 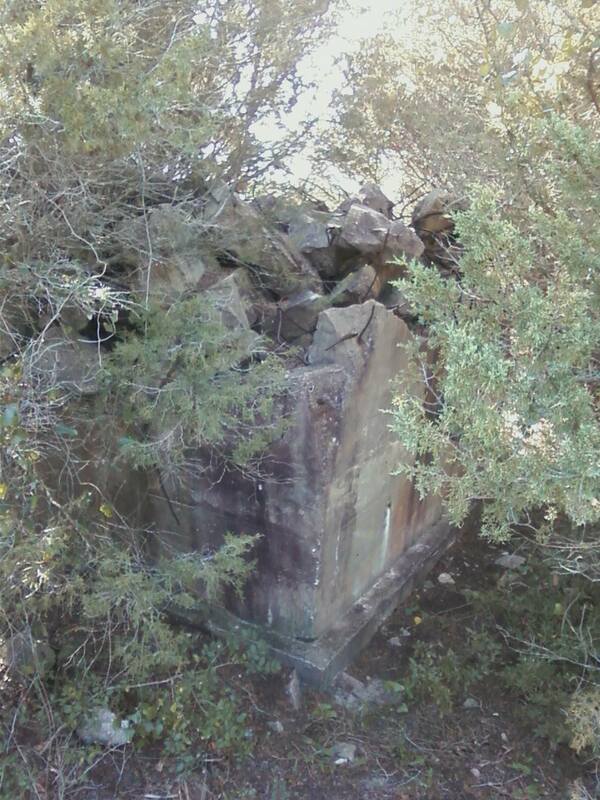 The section of mat I photographed was lying in the sand down the hill from the remnants of the Navy's 1942 radar tower on Loop Shack Hill, which is on the left of Highway 12, just past the edge of the village. Today, only the fractured concrete base of the tower remains. Originally the Loop Shack included a square wooden housing (with shuttered windows) mounted on the base. A metal grid-work tower rose above the house. 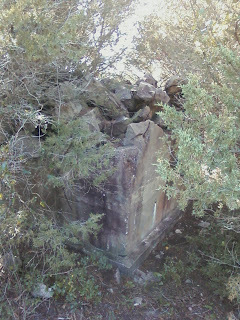 Concrete communications buildings were located nearby. "At the Loop Shack the Navy had radar and jamming equipment which was all very new, along with new listening equipment controlled from shore, and radio high frequency direction finding gear. This gave them the capability to locate the German U-boats that may have gotten past the floating mines and anti-submarine nets which were placed along the coast by the Navy. All activities were kept secret and all that the people knew was what they saw." "The Pamlico sound is thirty-five miles wide and seventy miles long. There is a place in the middle of it where, with no land in sight, you can run your boat aground, even if you only draw three-and-a-half feet of water. We found that place. It's called Brandt's Shoal." Summer visitors to Ocracoke often imagine that Ocracoke in the winter is dead, deserted, and dismal. Shops and restaurants are mostly closed, there are no performances at Deepwater Theater, Park Service interpretive programs are suspended, and the ocean is too cold for swimming. All of that is true, but there is plenty to do for those of us who live here. It is a time for pot luck dinners and other get-togethers for family and friends. I still play poker every Friday night. School basketball games draw large crowds. The churches and other non-profit organizations offer spaghetti suppers, bake sales, and movie nights. Gaffer's pub hosts periodic Trivia Nights and a Thursday night local Jazz Ensemble. We walk on the beach, visit neighbors, and join friends for parties and other social events. Some of us play bridge, make quilts, draw, read, learn a new language, or build boats. Of course, many of us work all winter: school teachers, hunting guides, grocery store clerks, carpenters, plumbers, preachers, and others. About 150 children attend school. Shop owners may take time off for trips and other off-island adventures but there is always planning and other winter responsibilities (cleaning windows & shelves; repairing and maintaining buildings; ordering new merchandise; e.g.). Officers and members of island organizations still hold regular meetings, plan events, raise funds, and contribute to the well-being of the community. Life on the island, even in the dead of winter, is full and rewarding. It is anything but dull. 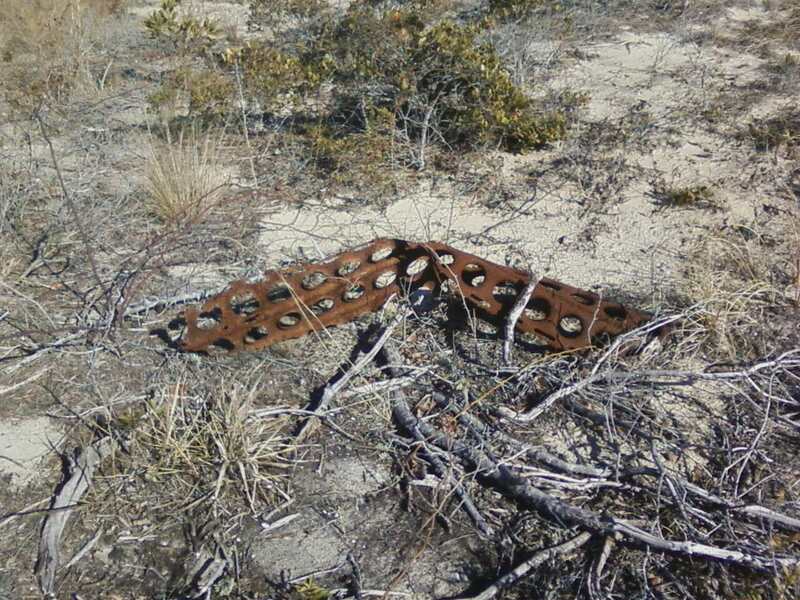 I am wondering how many of our readers can identify this scrap of rusted metal. 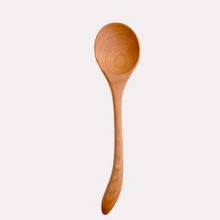 If you think you know what it is, please post your comment (even if someone else has already figured it out). You might even want to share any stories of your encounters with these objects many years ago. I will add my comments sometime next week. http://www.villagecraftsmen.com/news012112.htm , our latest Ocracoke Newsletter. Yesterday's post was timely, and a tad ironic. Just a few hours after posting "Shells on the Pavement" I had an opportunity to join friends for a walk on the beach. Fran & Phil are from Memphis, and they mentioned that they needed to take their rental car to Jimmy's Garage to get a flat tire fixed.